Disbelief that Xenon/LED’s are only available on a P2 package? I agree with you. BMWs have Xenon as standard. I just ordered an E550 but did not go Xenon because I didn't want the other options and $2,400 is too much for brighter headlights. The halogens work pretty well. I have read on line that there are a couple of minor changes for 2011 but standard Xenon is not one of them. When you consider the fact that the lighting package on some models like the ML is well over a grand then the P2 package is a bargain. As so far as being std on a 50K car, where are you buying an E for 50K??? Mine listed out for over 60K. Having had earlier E's without Xenon I can tell you first hand that there is a world of difference driving at night with them. Each country's marketing dept decides what equipment is standard on each model. For example, Canada has standard Xenon and much more. Competitive forces and surveys determine how cars are equiped for each market. In any event to spend 2400.00 more for Pack 2 is a bargain and insignificant as a percentage of the total price. Also keep in mind you are only paying half of the amount on a lease or recovering half the cost at trade in time of three or four years. Personally I would not own a MB without all the features and toys. It's what makes a Benz a Benz. I concur that it's a bargain when grouped with the P2 Package. With all the extra's you get with P2 (some admittedly not something I would care to pay extra for on their own, if the Lighting Package wasn't included), not to mention of course the great HID/LED combo (which will also set your W212 apart from the crowds to some extent, in the U.S at least), regardless of paying it via Lease or Buy, I personally didn't see why a measly $2400 would stand in the way of me getting it, especially considering I'm getting into a $60K car anyway. Last edited by K-A; 06-02-2010 at 04:53 PM. MB could just include it "for free" & up the MSRP but either way you have to pay for it. I recall paying $1500 extra on my Porsche for Bi xenon lights as a stand alone option on a $50k+ car so I was already use to it. P2 is a bargain but the catch is you have to pay for P1 to get it which is what bothered me. Yeah, Xenon's usually run over $1K anyway, for German manufacturers, almost $2K isn't a stretch for just that. The other stuff IMO is just a perk, but what sold me on P2 by far was the lighting Package. You are really not paying for P1 but the P2 price includes all the P1 stuff. Now who would buy one of these things without at least P1?? Do not know if thats even possible. It is possible to buy the E w/o p1. I did a search before purchasing & couldn't locate a single one so it would require a special order. Paying $2k for a $200 garmin navigation doesn't appeal to the business side of me but the rest of the options seemed to have value. The lightning package is ALWAYS worth it, if you can find the car. The problem is cars with the options you want are sometimes hard to find. If you were going to custom order a car, I'd certainly get P2 package. I agree it would be nice if 50+ K cars had xenons standard. My SLK didn't have them either, and it was really frustrating to have a 57k sports car with no xenons. I bought a $270 MTEC HID kit on ebay and with the projector lenses, it looks very good. Nevertheless, I would have *always* preferred factory lights that are precisely engineered and aimed. What I don't like in regards to the Lighting Package, is how since the W212 stupidly doesn't allow you to manually control when the lights come on or go off, every time I pull into my Garage, or start my car, it fires up the HID's for just that period of under a minute or so. If those babies burn out while on your dime, it's not too pretty. Turn your garage lights on = problem fixed. No what is dumb is the fact you have to PAY for split rear folding seats AND xenon at a car..this price. Not in Canada, eh ! Both are standard features on all E Class models. Xenon has always been part of the P2 package in USA on W211 and W212, in addition they were in the P2 package for W208 and W209 CLK, W207, W140, W219. They were always sold as an stand alone lighting package on R170,R171,W203, W204, W163, W164,W251 and GLK. They were included in P1 package for W219 only. They were standard on W140, W215,W216, W220, W240. If you look at how Mercedes grouped Xenon lights, on cars with a starting MSRP under $45k they are sold as separate stand alone option. Cars with a MSRP of $45k+ but under $80K they were sold only in the P2 package. Cars with an MSRP $80k+ they are standard. So I highly doubt Mercedes is going to make them standard on cars under $80k any time soon as they have recently made them standard on those cars and depending on the model they were always included in the P2 from the late 90's when they first came out till recently on those cars. As far as complaining about the E-Class missing a feature that BMW 5 series includes as standard, how about mentioning all the options BMW charges for which are standard on the E-Class? Most importantly Dynamic Handling Package which is $2700 on 550I but included standard on E550? Or how about Sport automatic transmission with steering wheel shift paddles which are $550 on 550I and standard on E550? Those 2 option cost more than the difference in the price between P1 and P2. So if you are looking for 1 option only and ignore all other options 1 car options might suit you better than other manufacture but in general once you start to load cars comparably and compare between Audi, BMW and Mercedes they end up costing very close to each other. It would be nice if you could order all opinions ala cart except then dealers would have people complaining that they don't want X option and want to only pay for option they want etc and dealers would have to stock more cars or be forced to discount cars more because it would be cheaper for consumers to special order cars with exact options they want over taking cars on dealer show room floor. So manufacture's by putting as much equipment as possible in packages gives the consumers less build choices thus requiring dealers to stock less cars and running a lower risk of building cars with too many options that consumers will refuse to pay for. I am so confused with how MB grouped the lighting packages. I myself don't own a w212. But I want to purchase the LED "Hockey Stick like" DRL for my vehicle to retrofit. However, by driving around, and looking at pictures, I have discovered that they have two different colored LED Hockey stick DRLs. I have seen BOTH yellowish (to match halogens) and blue (to match Xenons). Can anyone tell me which ones are OEM (or if they both are) I would much prefer the blue color, but I have no idea if I order the OEM ones if they are blue or yellow. @K-A you have the LED's I am talking about, are they blue or yellow? Also, if you don't mind, could you take a picture or explain how they are secured to the car? I would like to know this before I buy it to plan the retrofit. On my vehicle the mesh is secured by three Torx Screws, but I can't see any screws on the LED mesh, does it simply pull out? Actually, the Halogen cars come with the double-fog lights, which have one set on during the day, in the yellow-y color. Mine are the Hyper-White/Blue LED's that come with the P2 Package (HID Lights, etc.) and are in the hockey-stick shape, obviously. Yeah, I'll try and get you a picture asap. However, I think that it should be secured in the same fashion that you describe? Thanks so much for your speedy and fast reply! In another thread I had in the 204 forums I used two different pictures that I found of the hockeystick DRL with two different colors. 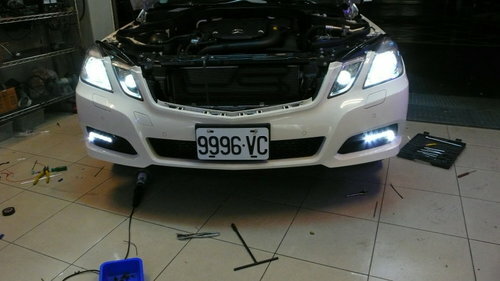 I want that exact color, is that how your led looks like, or is that aftermarket? Oh wow, I've never seen those strips not using actual LED's? It looks like it's the same exact strip, yet with a halogen bulb? Doesn't look too hot comparatively. Yeah, in the U.S, if you get the Hockey Stick shaped "Fogs", they will be real LED's, and the lights will be HID's. hi, if i want to get a HID conversion kit and upgrade my headlights into HID, which brand should I go for? I tried to search for Mtec, but cant find the conversion kit for W212. Does not matter what brand, in my estimation they are mostly all junk made in China or such. They do not have many of the features of the OEM ones such as self leveling, bixenon, and adaptive turning. Yes you will need lots more thsn the bulbs. Spend some money on some quality products like modification with OEM retrofitting conversion...Give this guy a TRY! You wont disappointed !!! Caesar a stand up guy with a lot of knowledge. I definitely recommend Light Werkz. I have heard nothing but good feedback from people working with him! But I have not seen his work on any MB cars here yet. Anyone is looking for Xenon conversion should take a look at his work first. Quick Reply: Disbelief that Xenon/LED’s are only available on a P2 package?